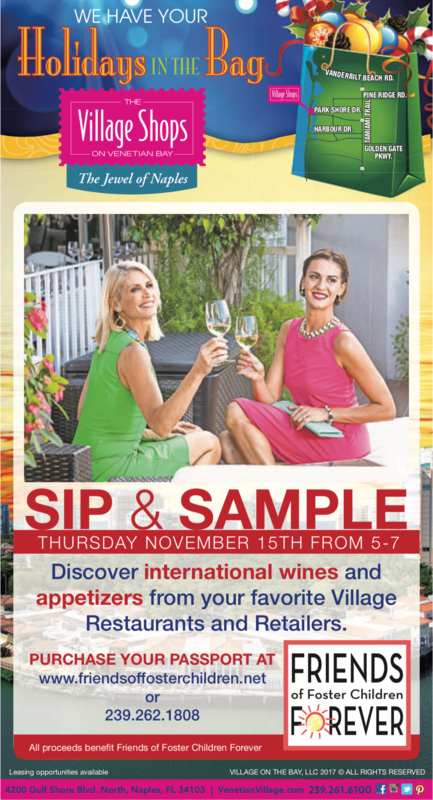 Sip & Sample at The Village Shops on Venetian Bay! 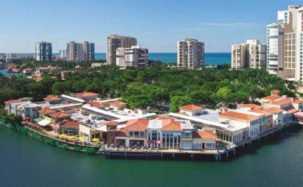 It’s not too late to purchase your passport to attend the 9th annual Sip & Sample at The Village Shops on Venetian Bay. The event will be held on Thursday, November 15th, from 5:00pm to 7:00pm, with all proceeds benefitting Friends of Foster Children Forever. Each year, Friends of Foster Children Forever and the merchants at The Village Shops collaborate to raise money to benefit foster children in the local community. Attendees are asked to purchase a “passport” for the event, which allows travel from shop to shop and restaurant to restaurant. For $40 per person presale, $50 night of, guests can enjoy complimentary samplings of delectable appetizers and international wines from the restaurants’ award winning menus and high-end designer boutiques, while taking in the waterfront views. This year’s Sip & Sample participating merchants are Casanova Boutique, Chico’s, DanaTyler, Fabec-Young & Co., J&K Collections, Lux Boutique, Mondo Uomo , Patchington, Sperry/Natural Comfort, Sukie’s Wine Shop, The b. Store, Whispers of Naples, Wildflower, WM. Phelps Custom Jewelers, Bayside Seafood Grill & Bar, Fish Restaurant, Rendez-vous French Café, M Waterfront Grill, MiraMare, T-Michaels Steak & Lobster House, and The Village Pub. Sip & Sample passports can be purchased online at www.friendsoffosterchildren.net to support the vital educational and mentoring programs for local foster children. The FFCF mission is to focus on the children they serve by providing targeted educational and enrichment opportunities that allow each child to fulfill his or her potential. The charitable organization works to fulfill the unmet needs of every child who enters or, is at risk of entering the foster care system in Collier, Hendry and Glades Counties. From Thursday, November 15th through Sunday, November 18th, ten percent of all sales from collected receipts will benefit Friends of Foster Children Forever. Shop before, during, and after the event, and drop sales receipts in drop boxes located on the south side of The Village near Pratt’s Shoe Salon or on the north side near Panache.